I started knitting this blanket back in February, knowing that the baby is was intended for wasn't due until sometime in May. As I had just finished knitting a different blanket for a different baby, I was pretty slow working on it. The baby arrived a couple of weeks ago, so I am now frantically knitting away. Here is a photo of my progress. I was about 50% done this time last week, and I would say I'm about 70% done now. 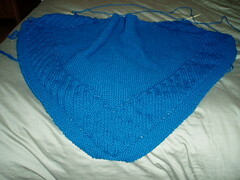 While the pattern is great, I have to work a pattern every other row, so it is a bit slow going.